37. 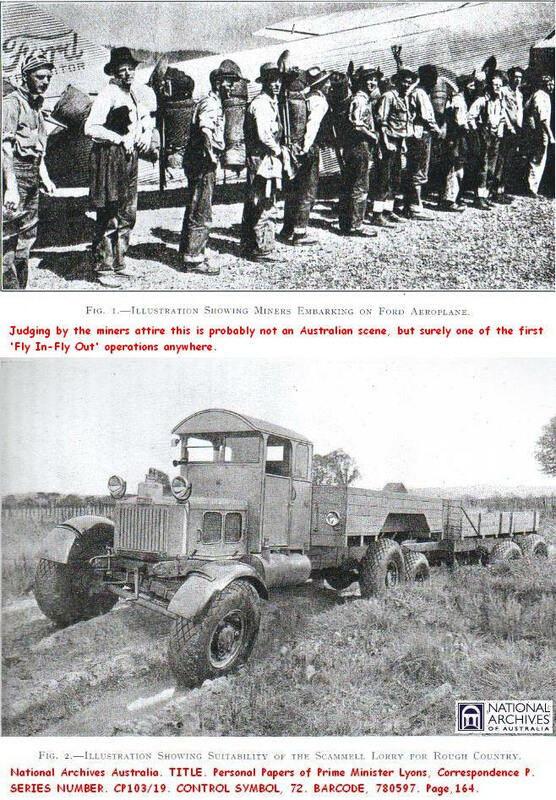 BRITISH AUSTRALIAN PROSPECTING Co.
"This Expedition will be the first to utilize the most modern land and air transport in Australia"
Prospectus. British Australian Prospecting Co.
On the 11th of August 1932, H. Theodore Price wrote to the Honourable J. A. Lyons, Prime Minister, with a proposal to prospect vast areas of Central and Western Australia using modern land and air transport in the hands of experienced prospectors and bushmen. No doubt Joe Lyons smiled, he had heard it all before when a Minister in the Scullin Government, Price's proposal and the accompanying prospectus was remarkably similar to the grandiose plans of the Central Australian Gold Exploration Company. There are many familiar themes in the prospectus of the British Australian Prospecting Company, first the economic appeal and the likelihood of vast gold deposits waiting to be discovered in the unexplored centre of the continent, thus saving the country from economic depression, to the usual pitch for financial assistance from the Government by waiving customs duties on imported equipment and concessions on transport and fuel. And of course Australia must carry out her patriotic duty, "It is Empire development in reality". Lyons probably reached for his copy of Lasseter's Last Ride and called for the C.A.G.E. file, perhaps wondering if Idriess and the Baileys had a hand in writing the prospectus. The London based company, variously known as the British Australian Gold Exploration Company and the British Australian Mining Syndicate Ltd, planned to prospect an area of 15,000 square miles in the vicinity of the Warburton Ranges in Western Australia, where it was 'presumed' that extensions of the Murchison and Coolgardie gold fields would be discovered, "this presumption is supported by the evidence of Aboriginals bringing in rich quartz specimens from unknown locations". The cooperation of the 'hostile natives' inhabiting the area would be "secured by gifts of food and useful articles, thus enlisting their active support in the operations of the Expedition". Those same hostile natives who had attacked Talbot's 1916 expedition and were implicated in the murder of Lasseter's mates, Johanson and Smith, would be the subjects of cinematograph pictures by an important film company that would travel with the expedition to record progress, and the customs and corroborees of the Aboriginals not yet touched by civilisation. The profit from the sale of the films would be shared by the exploration company and the unnamed film company. The same secondary objectives as the second C.A.G.E. expedition lead by Bob Buck. Yes, Joe Lyons had heard it all before. The prospectus, dated the 4th of August 1932 and clearly marked 'PRIVATE AND CONFIDENTIAL' and 'NOT FOR CIRCULATION', listed the following equipment, three eight ton Scammell lorries, one three engined all metal Ford aeroplane, two scout aeroplanes capable of being carried on a trailer and an improved light boring machine with compressor and necessary plant. Apparently the prospectus was not private or confidential and was circulated to Ion Idriess, the endpaper of his best seller contains the following passage! A London company is including in the equipment of its expedition a three-engined aeroplane, two scout planes, three six wheeled tractors, and a light boring machine; and with an efficient staff is prepared to prospect an area of fifteen thousand square miles of unknown country. The above passage could not have appeared in any editions of Lasseter's Last Ride prior to August 1932, further evidence that Idriess frequently amended or added to the story as additional information came to hand, although this appears to be the last change to his best seller. In mid September H. T. Price received a courteous reply via Lyons private secretary, expressing interest and best wishes, and the Minister for Trade and Customs would consider waiving customs duties, "as soon as you are able to make a definite submission to him". Nothing further was heard from the British Australian Prospecting Company. in 1937 Herbert Theodore Price attempted to sell his interest in several untested gold mining leases in the Davenport Ranges to the Davenport Ranges Gold Prospecting Syndicate. Price, as vendor would receive 200 £10 shares in the syndicate and £1000 cash, however he was now well known to the Northern Territory mining authorities and Mr. Norman C. Bell, the Director of Mines reported that the formation of the Davenport Ranges Gold Mining Syndicate should be viewed "with considerable suspicion". The Directors of the syndicate took heed of Bell's report and the share issue lapsed. In fact the endpaper to Lasseter's Last Ride makes interesting reading, "Now that Lasseter's Country is proved beyond all doubt to be auriferous", apart from the promotion of dubious gold mines by Price, another character with shady gold mining connections is mentioned, namely Patrick Whelan. It was Whelan's report of the discovery of rich gold in the Livesey Range that prompted Errol Coote to become involved in another aerial prospecting venture to the area in 1932, of course without success. N.A.A. Personal Papers of Prime Minister Lyons, Correspondence 'P'. Series,CP103/19. Control 72. Barcode,780597. Pages,157-165. Davenport Ranges Gold Prospecting Ltd, Report on Company Properties by Director of Mines N.T. Series, A1. Control,1937/5553. Barcode,839433. Idriess Ion L. Lasseter's Last Ride. Endpaper.